As we say goodbye to summer for another year, we welcome the fresh, seasonal produce that Autumn brings. The change in season opens a whole new world of flavours & food diversity; different recipes we can create to nourish us from the inside out. And Sumo Salad’s new Autumn menu does just that! It’s loaded with quality, seasonal foods that are organically designed by nature to keep us healthy at this time of year. Sumo Salad’s Autumn menu is loaded with nutritious, seasonal veggies like pumpkin, broccoli, avocado, baby spinach, tomato, capsicum & mushrooms. These foods taste better and boast incredible texture & crunch because they come fresh, straight from local Aussie farms, so they don’t need to stored for excessive periods of time or travel half way around the world (& this is better for the planet too!). Using seasonal produce also means Sumo’s new Autumn menu is nutritionally superior, providing a tone of health benefits! All fruits and vegetables start to lose nutrients immediately after they are harvested, so the fresher, the better. By using local Autumn produce, the nutrition content of the ingredients in Sumo’s salads is maintained, especially when it comes to nutrients like vitamin C, folate, antioxidants & phyto-chemicals, which are susceptible to losses during storage & transportation. Consuming seasonal produce also means you are eating foods that are naturally higher in nutrients your body craves at that time of year. For example, the signature salad I designed for Sumo contains veggies that our bodies thrive off in Autumn. I chose to use tomatoes, capsicum & pumpkin as they contain Vitamin C which is very important for preventing infections such as colds & flus. I added garlic & shallots which are high in antibacterial & antiviral components to boost our immune system & keep us fighting fit coming into the cooler months. Plus I also included baby spinach, almond slithers & ancient grains for a hit of non-haem (plant) iron to boost our energy levels as we start to feel the tiredness hit as winter sets in. And I also chose avocado because, well everyone loves avocado! But its also in season and helps to boost our healthy fat intake & keep our skin and hair from drying out in the autumn weather. So as you can see, there are so many health benefits to gain when you choose fresh, seasonal produce. 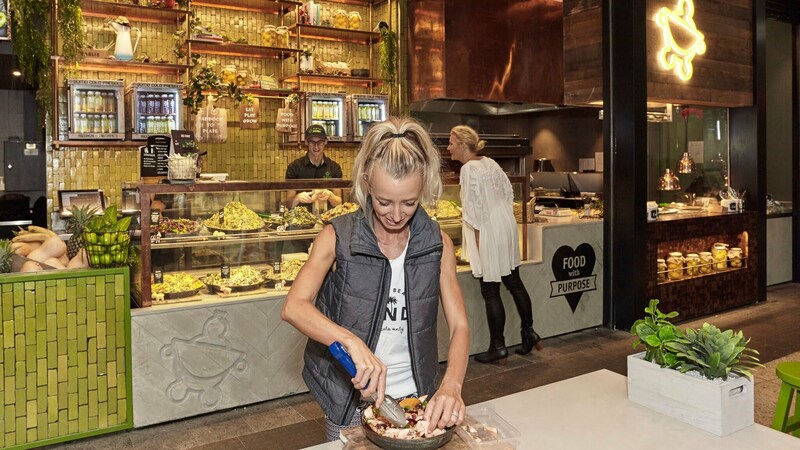 If you want to create your own salad using seasonal Autumn ingredients sourced from local Aussie farms, head into a Sumo store today like I did and create your own signature Autumn Salad! 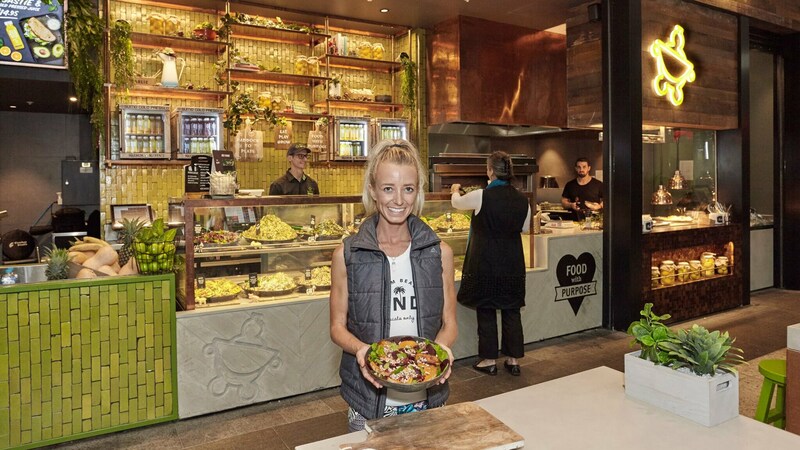 Check out the pics below from my visit to the new Sumo Salad that has recently opened in the Galeries, Sydney! If you haven’t been to this brand new Sumo Store, drop by, say hi & enjoy a freshly made Autumn salad! The new Sumo in The Galeries looks stunning and has such a healthy, positive, fresh vibe to it! I highly recommend visiting! *Sponsored Content: This article is proudly sponsored by Sumo Salad. Why? Because I love Sumo Salad and only recommend companies that I truly believe in and who share the same approach to health as I do. All opinions are my own and not influenced in any way. I love this post and I think it’s so true!! In this particular season however, we can use a lot of frozen fruits that aren’t in season to make smoothies! !